• High school: Christ Church Episcopal, where he set a school record with two 51-yard field goals as a senior. • College: Went to Clemson, where he was the school’s all-time leading scorer with 404 points in 53 games. • NFL: Kicker for the Arizona Cardinals with 15 straight field goals, the longest of them 51 yards. He is currently tied for the second-highest points from a kicker with 56. 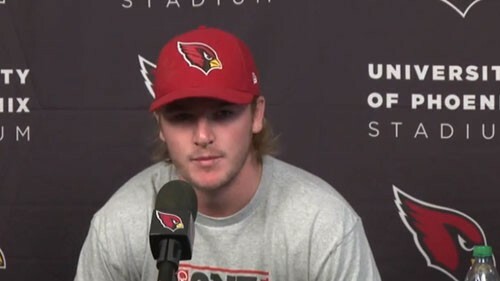 TEMPE – Arizona Cardinals head coach Bruce Arians said he had confidence in kicker Chandler Catanzaro when he chose him over veteran Jay Feely back in August. But the rookie has surpassed his expectations. Catanzaro tied the NFL rookie record for the longest streak to start a season by making his 15th straight kick in Sunday’s win against the Oakland Raiders. His 56 points for the season are the second-highest in the NFL. With 33 seconds left Sunday, Catanzaro put the game out of reach by hitting from 41 yards. The 24-13 win lifted the Cardinals to 5-1, their best start since 1976. Catanzaro’s next field goal without a miss would break the rookie record set in 2012 by St. Louis’s Greg Zuerlein. Breaking a record wouldn’t be new for Catanzaro, who owns Clemson’s records for extra points made, field goals over 40 yards and consecutive field goals with 20 in a row. 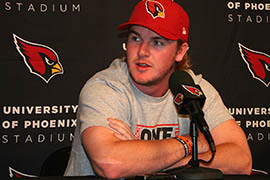 While Catanzaro said he’s confident he can set records in the NFL too, he laughed about sharing his plans with Arians. Arians might not be that surprised, as he said he sees the rookie’s talent after his record-tying start. The stats may say he’s perfect so far, but Catanzaro said Sunday’s field goal came too close to missing. The same goes for a close call in week two against the New York Giants. Streak or no, Catanzaro said his primary focus is on improving. The Arizona Cardinals showed they are a force to be reckoned with. With a win against the Raiders and a record breaking kick the Cardinals now sit at the top of the NFC West. Arizona Cardinals kicker Chandler Catanzaro has started his rookie season with a record-tying 15 straight field goals.